Blue raspberry is a common flavoring for candy, snacks, syrups and soft drinks. The flavor presumably comes from Rubus leucodermis, more commonly known as the "whitebark raspberry" or "blue raspberry" for its bluish-black fruit. 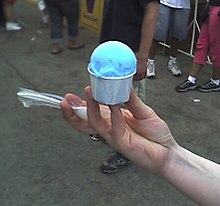 Blue raspberry food often contains a bright blue food coloring, the most common being Brilliant Blue FCF, although this coloring is not the color of the actual color of the fruit, which is almost black when ripe. The blue color also helps distinguish raspberry-flavored foods from cherry- and strawberry-flavored foods (cherry is usually colored red, and strawberry is also sometimes colored red but is often colored pink if the same product is also available in cherry ). ↑ "Rubus Leucodermis - Exoplantus". exoplantus.fr (archived August 23, 2011). Archived from the original on August 23, 2011. Retrieved January 10, 2014. ↑ "Natural-Food-Color.com". Natural-Food-Color.com (archived September 12, 2012). Archived from the original on March 9, 2012. Retrieved January 10, 2014. This page was last changed on 16 January 2018, at 18:56.